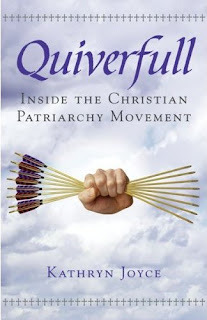 I found Quiverfull : Inside the Christian Patriarchy Movement when browsing the list of titles linked up to Semicolon's Saturday Review of Books a few weeks back. Civil Thoughts reviewed this book and I just had to find a copy for myself. I quickly hopped onto our library's website and placed a hold on the title. Then I just sat and waited for it, with bright, shiny eyes and hands rubbing together in gleeful anticipation. I am happy to report that this book did not disappoint in my expectations for it! It surprised me with its accuracy, but it did not disappoint. I'm so excited about this book (define that very carefully!) that I'm not even sure where to start. Joyce is an excellent researcher. There does not seem to be one stone left unturned when she was exploring the vastness (or perhaps not so vast-ness) of this conservative "movement." She spoke with Nancy Campbell of Above Rubies. She read DeMoss. She explored the writings and teachings of The Center for Biblical Manhood and Womanhood. She saturated herself inside Vision Forum and attended Martha Peace events. Mary Pride books were also consulted and she talked about HSLDA. (Morecraft, the Pearls, Bill Gothard and a few others I'm not listing here also got a "nod" from Joyce.) I was extremely impressed with how thorough - and how very accurate - her remarks were about each of these individuals and ministries. She knew of whom she was speaking and she represented them well with accurate quotes and spot-on accuracy in translating the message of each of these organizations. The message she deduced from researching these organizations? That there is a movement towards a fundamental return to scriptures to discern what roles men and women are to play and what a Christian's attitude should be towards procreation. The "problem", if you will, is that Kathryn Joyce does not care for the message that men should be the leaders, women the submissive followers and that the two combined should 'people the world.' As a result, I found this book mystifying, fascinating and an all-together enjoyable reading experience. And I don't agree with her conclusions at all! Joyce was, I felt, above all, respectful of her subject matter. Her manner of writing is meant to be informative, primarily. She uses few of her own words to lay out her opinion on this "movement" and when she does speak for herself, there is a strong sense of disapproval. However, her chief aim is to be informative and she does that very well. Knowing the people of whom she spoke - sometimes knowing them personally myself (she dropped a few names of some people I know directly which was amusing to me!) - she captured the argument that Christians are to be "fruitful and multiply" very well. I'm repeating myself but I do want to state very clearly that I thought she was accurate and fair in her assessment of the facts. It is true. There is a movement, a reformation if you will, that is drawing Christians back to the Bible for advice on all sorts of things. Christians want to "get back to the basics" and find out what scriptures have to say about money, marriage, children, family, life, etc. Although Joyce fixated on one particular aspect of this movement, there was so much more she could have written had her scope been a tad bit broader. Even still, it seemed hard for her to focus on the concept of children alone. Although the title is Quiverfull , insinuating she was going to look at the numbers of children being birthed by Christians, she finds it very hard not to talk about how wives and mother's bodies, emotions and freedom fare in all of this. In other words, she doesn't find the lifestyle of a woman bent on having a family and nurturing and caring for them all that appealing. Hold tight, though. At the very end of the book she concludes that there is a grain of truth to this concept of Biblical manhood and womanhood and family, if you will. However, she argues that groups and sectors of the Christian population have taken this too far and pinned too much on women bearing children against their better judgment, amid health concerns and "at all costs." She took particular issue with Vision Forum, dedicating a great deal of her displeasure towards Doug Phillips and the like. Now, I'm not really a big fan of Vision Forum on the whole, and some of the examples that she gave for some of Phillips' extremism is rather regrettable. While researching, though, Joyce made a friend - a Christian woman - who told her that she was focusing on people's strict belief system and not their Christian faith and that was affecting her opinion. I would have to say that that is most definitely the case. She really shares the worst about Vision Forum (and pinpoints some of the things I rather don't agree with them myself on). I can sympathize with her own vision of them and translation. It's easy to misinterpret some of the things that come out of that organization. 2. Women are locked into roles of seclusion within their homes, to be assigned nothing but childbearing and childcare, regardless of their talents, wishes or personal desires. In answer to number one, I have to honestly say that I do not know of an "official" position on how women are to deal with abusive husbands so I cannot speak authoritatively on that point. I do know what my position is and it's more along the lines of a "one strike, you're out!" rule. Women in life threatening or endangered situations should not be required and or forced by anyone to stay in such an unhealthy environment. There is a verse in scripture that says that women should submit to their husbands and if the husband is unsaved she should attempt to win him by her behavior, continuing to respect and love him. However, if he is abusing her, I see nothing in scripture that requires her to put her life or family at stake in hopes of winning him. She may flee the home (with the full blessing and support of other Christians, I would sincerely hope!) and let someone else approach him regarding his repentance and salvation. That is my very firm opinion and to say otherwise I think is to take scripture too far under the word "submit." I do think feminism has tried to make women discontent at home. Society has mocked the idea of a large family or worse - hasn't even tried to understand it. Instead of saying, "Children are a blessing" they are more apt to say "children are an inconvenience." Instead of promoting the concept of building a family, society would rather say, "don't give us more than we can bear to raise on your behalf." We DO need to return to the basics and find out what the Bible says about children. Since I more readily identify myself with the "quiverfull movement"
response to that bookjacket flap, "You ignore me at your peril?" Children are a blessing. They are fearfully and wonderfully made. We have the gift, opportunity and blessing to make them a part of our lives. Why would we not? This book wants to make an attack on the "patriarchy movement" but while it intends to give a stomach punch, it ends up feeling like a mere flick. I think that the groups and people that Joyce interviewed, investigated and critiqued would say that her representations were accurate for the most part. They DO think children are a treasure. They do NOT think that we should limit our joy in having one or none. They WOULD promote the concept of family and would argue that men are to lead boldly and women to follow the lead in happy surrender and love. (What Joyce mentioned but didn't fixate on is that the women who are following are also called to be respected in their calling. Read: Not respective of the male alone. Rather, the man should respect the woman and love her as she follows his lead. Submission with honor and reverence on both sides.) There are unhealthy marriages on both sides of the line, folks. Christian or no, the world is pretty messed up. Some Christian marriages are successful and have produced many more children than the new sedan has seats for. That should not make them oddities and should not hold them up for ridicule and speculation. If nothing else, than in the "spirit of tolerance" which the modern world cries for, they should hold back their critique and speculation and welcome the children with open arms and without hostility for their existence. To argue against the Christian population is something I find in remarkable bad taste if you want to express "tolerance" for all. If Joyce was truly feeling tolerant, this book would not have been written and I know that. So for her accuracy in reporting, there is still subversiveness to the world's culture not to notice people by color, race or size of family. Please note, I boldly tell you that I do not see this book as a threat at all. In fact, her arguments had about the exact opposite effect on me than she meant to. I just want to point out that fair's fair. She is welcome to this book and, according to her own arguments, I am welcome to my children. I'm good with that. Unfortunately, a lit of churches view DV the wrong way. Some would encourage a woman to still submit. I know a number of Christians in this sort of situation. I think my browser ate the last comment. This book sounds very interesting. I think I'm going to have to read now. I would say our family falls into the Quiverfull category, but we don't buy into everything that prescribe too. I read the review that you linked to before reading yours to see where you were coming from and I would say there's a difference, albeit slight, between the Quiverfull and Patriarch movement. In my opinion, there is a difference DeMoss/CBMW compared with Vision Forum/Above Rubies/etc, not in the important things, but in how they practice them. Sometimes it's strange to me how people often see submission as this insane, archaic tradition. When it's really the example of Christ. I think you're right about the abused wife situation, I believe if a man/husband is being unlawful to God or the state the wife should not submit. I really like how you handled the review, your opinion, and the Truth. Kudos! And while I do believe there are many reasons to have more than 0-2 children, "be fruitful and multiply" was spoken to an unpopulated earth where survival depended on having enough children to work the crops. Modernity brings with it a host of considerations before embarking on having a dozen children that should be prayerfully considered. And I just haven't encountered that reasoning in Vision Forum materials. I think your post really educated me. Thank you for a well written, and a well-informed, sound post! I just wanted to chime in here, Carrie, and posit that although I have lived in the Bible belt my entire life (minus a few years Up North when I was a child), I have NEVER ONCE heard a conservative minister (or layperson, either, for that matter) suggest that a woman should stay with an abusive mate. Never. In fact, my pastor brought this very subject up tonight, to reiterate that this situation is NOT God's will. I am familiar with the quiverfull concept and the "patriarchy movement" (although never heard of it termed that way before). I agree and disagree with several things in both areas. Still, your post was very insightful and well thought out. I enjoyed reading it. I have no problem with people who hold many of these views, as long as they realize that their views might be more opinion/preference than defined theology. Things get tricky when people start giving too much weight to individual Scriptures. I wouldn't say we are Quiverfull people but having 4 kids 6 years and under makes me an oddity in this culture. We can't go anywhere without stares AND comments. I find the demographics of commentors fascinating. The 70-80 years olds smile at us, say my boys/girl remind them of their children, or even say I'm blessed. The 50-70 year olds say "God bless ya" but their tone implies I am anything but blessed. They also say things like "your husband must have a good job." The 30-50 year olds look at me like I've offended them personally and say things like "well, at least ya got it all over with." And that's all while I'm grocery shopping with my kids. interesting sounding book which seems to have generated a lot of discussion! I love that. I guess I would take issue with one this either you or the author said and that was about Biblical interpretation. I think the Quiverfull/homeschool/VF should be considered a conservative (or even fundamentalist) Protestant interpretation of the Bible. I doubt that much of what they say can be found in the early Church Fathers. Especially when it comes to the roles of men and women and the whole women's submission thing - that is a fairly new (1500??) and Western interpretation. An interesting idea would be to take a look at and compare the Western marriage rite with the Eastern rite ceremony. But, that is probably a tangent (LOL). Greetings from Texas! And, before you ask, no I am not part of Vision Forum. I am however well acquainted with with the afore mentioned movements and happen to be blessed to know some of the men Joyce mentions in her book personally. (Though I have yet to read it.) And, have read several of the others' works. 3. And, don't get caught up in the words of one man- in other words, for example- I think Doug Philips has lots of good biblical things to say, I may not agree with every one of his applications, so I always go to my Ultimate authority, the word of God. (1 Corinthians 1:12) Remember men, even godly men, are not infallible...only the word of God is. So, when you listen to a lecture take it for what it is, the word of man and judge it by the word of GOD. 4. When talking about these various movements, remember that there are a lot of “off shoots” and sadly some un-biblical extremes that should be corrected. And, don't throw the baby out with the bath water. I personally am interested to read this book. I hope to be blessed with a large family and pray and trust that my children will all follow the Lord Jesus Christ and will raise their own children to do the same. I think the fact that Joyce sees godly women who love their God, their husbands, their children, and who are seeking to build Christ's kingdom here on earth as a threat to her worldview & culture (which I think she would ascribe to mainstream America) as a good thing. “She who rocks the cradle rules the world” That's a pretty impressive task for a any woman!